English vet Rick Appleton very kindly offered to volunteer at the PAWS clinic in April 2018. This was his third visit to Paxos and on this occasion he worked with Nefeli for 5 days assisted by Ann Hadj and other volunteers who helped to catch feral cats. Rick’s visit was sponsored by WVS who generously donated £2000 towards supplies. The night before his arrival, Nefeli and Ann had spent the night at the PAWS clinic trying to save a dog with heat stroke and brain oedema. Unfortunately, the dog died in the early hours which was a very sad start to Rick’s visit. However, Nefeli & Ann soon rallied and although they had not met Rick before, immediately felt comfortable working with him and the visit proved to be a remarkable success. Volunteers had been organised to help catch cats during Rick’s visit and from the first day they were kept busy with cats being brought in to the clinic. The team neutered 35 cats, 2 dogs, attended to several consultations and carried out an emergency operation to remove a ‘foreign body’ from a dog. Below are excerpts from the reports sent in from both Rick and Nefeli which explain in more details their time together working at the PAWS clinic. I am so glad I met and cooperated with Rick Appleton for 5 days at the PAWS clinic on Paxos. It was the first time we had worked together but we both felt comfortable with each other from the start. One of the cutest customers we had was a female cat that came in for spey with her little kitten by her side! … The people who brought the cat in told us that she never goes anywhere without her son, so they had to catch him as well! He was a lovely little ginger male and waited patiently for his mom to have surgery. We found him very entertaining and the opportunities for cuddles was very relaxing. As soon as his mom was awake, we put them together in a cage and they went back home happily with their owners! The funny thing of the story was that the same morning Rick came in to the clinic and asked me if I had ever removed a foreign body from a dog’s guts! We were obviously very surprised when the Labrador arrived and after examination realised something was obstructing the intestines. After further discussion with the owner, we decided to open him up and found the offending item was a sock! Rick & I were subsequently very careful about what operations we discussed in case it suddenly appeared .....! I do hope I work again with Rick and have even more successful cases. I never know quite what to expect when I visit to Paxos to help Paxos Animal Welfare Society. We always try and neuter as many of the island's feral cat population as possible, but there are always a few surprises! On arrival I was greeted by Nefeli, who I'd be working with for the week and I was ready to start work the following morning. Nefeli, Faye & Lindsay had organised for several volunteers to catch cats for us, and we were off to a busy start. Ably assisted by Ann Hadj, Nefeli and I swiftly had a production line of cat neuters set up. Nefeli and I were keenly aware that we had different approaches and experiences when it came to surgery and medicine and Nefeli was kind enough to teach me a type of surgical knot I had not used before. We were also discussing the type of surgeries we had done, and got onto the topic of abdominal surgery, Nefeli saying she hadn't had a foreign body procedure before. So, it came as quite a surprise later that day when Nefeli saw Bruno the Labrador who had been vomiting and was suspecting... a foreign body! 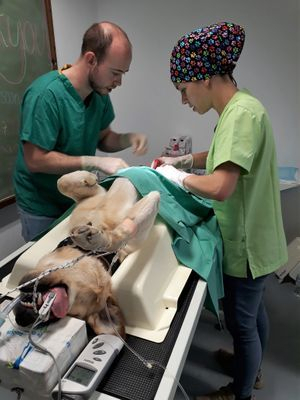 Theatre was prepared for emergency surgery and Nefeli and I discovered the cause of Bruno's vomiting - a sock! The offending sock was removed from the small intestine, where it had become stuck and I am pleased to say Bruno has fully recovered from his surgery and is doing well and apparently back to his normal self. This probably means that he hasn't quite learnt his lesson! PAWS is very grateful to Rick for once again volunteering on Paxos and is greatly indebted to Nefeli and Ann for all their hard work in making Rick's visit so successful. PAWS would also like to thank all the volunteers that helped during this week and of course WVS for their continued support to our charity.